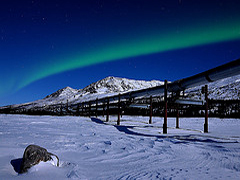 Fairbanks is the largest city in the interior region of Alaska - just 180 miles south of the Arctic Circle - with a population of about 36.000 people. Captain Barnette founded the city in 1901 setting up a trading post and during 1902 the first gold was discovered. Get ready for a few days of winter fun and adventure within the Last Frontier. 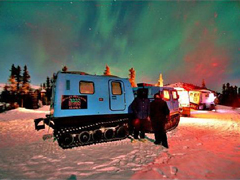 Choose from a variety of tours: Van Tours across the Arctic Circle on the Dalton Highway - aka: "The Ice Road" from Fairbanks, Alaska Flightseeing Tours, Gates of the Arctic National Park excursions from Bettles, Dog Mushing and our scenic Aurora Rail Tours to Talkeetna and Anchorage. 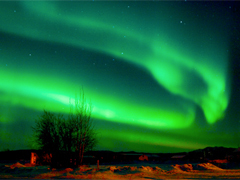 Fairbanks - your Gateway to Adventures ! Please note: The sightseeing tours can only be booked in combination with our tour packages. 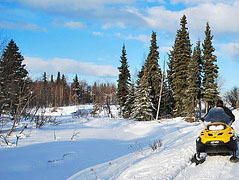 Explore Fairbanks and the surrounding area on this afternoon tour. Your city tour starts right from your hotel and combines fun with Fairbanks history, Alaskan craftsmanship and Alaska winter activities. 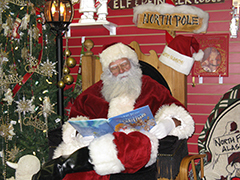 Your first stop is the Santa Claus House in North Pole. The tour continues on to the Trans Alaska Pipeline viewpoint. It is the perfect spot to explain the astonishing engineering of the pipeline and the oil fields in Prudhoe Bay. Afterwards you'll visit the Morris Thompson Cultural Center offering knowledgeable cultural programs and an interpretive exhibit gallery featuring the land, seasons and people of Interior Alaska and the Arctic. If you are looking for an authentic gift, then the Great Alaskan Bowl Company is the perfect place for you. Last stop either at the Museum of the North or the Antique Auto Museum (depends on the weekday). Have a thrilling ride on a dog sled pulled by happy huskies! This is the tour for everyone. Most ages and physical abilities can be accommodated. Our scenic trail leaves our cabin and takes you from winter woodlands with beautiful views of the valley. It also includes a straight run that is the perfect place for beginners to take a turn on the runners of the sled while the guide rides in the sled basket or you can choose our tandem sled option and stand on the runners for the whole run!. 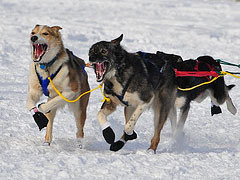 You'll get to see the how the dogs are harnessed and hooked to the sleds then climb on board for the run. Afterwards you can take your time: meet and greet the dogs and take lots of photos. The 3 hour tour starts with instruction covering basic dog care, equipment use (sled, gang lines, etc.) 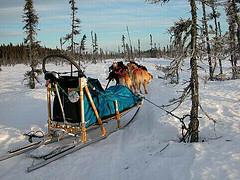 harnessing and hooking up the dog team, followed by one-on-one instruction with a guide/musher driving the sled. When you are ready and the guide feels you are capable, the guide will switch places with you and you will take a turn on the runners. 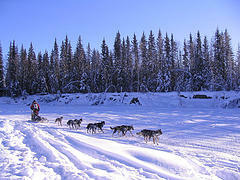 Then it's back to the cabin for a short break and setting up the sleds for smaller teams. 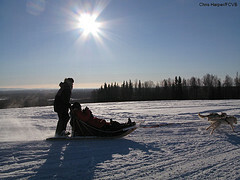 Next is a 6-8 mile run driving your own dog team and sled! Finally the tour ends with instruction on un-harnessing, equipment checks and dog care after the run (checking sled and lines, checking dog feet and water and feeding, etc.). Optional add another 1.5-2 hr of mushing for $200. Your Ice Fishing day trip begins with the pick up from your hotel. While catching fish in a warm hut on a beautiful lake you can still safely enjoy the brisk, clear air and peaceful environment of Interior Alaska, the home to some of the best ice fishing this state has to offer. 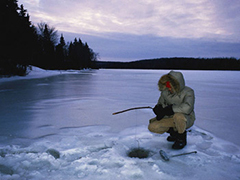 Learn the old native skill of ice fishing from our experienced ice fishing guides. Hot drinks and grilled fish for a late lunch are served while fishing. Warm arctic gear is available and our heated van is always close by. Please provide each participant’s height, weight, and shoe size for the arctic gear. The tour price includes: hotel transfer, arctic gear, fishing license, tackle, hot beverages and lunch. 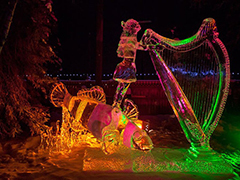 Every year the world’s best ice artists gather in Fairbanks, Alaska to create the finest ice art in two spectacular ice sculpting events. Do not stand in line to get tickets but be treated as a very important person (VIP) and get a first rate experience at the World Ice Art Championships. The guided tour includes narrated transportation along the single block classic and multi-block classic displays. An ice artist is available to create a special sculpture just for you. Also, your visit to the “Fun Park” is a delight for all ages. The souvenir shop and complimentary hot beverages will be the “finish line” of this extraordinary day at the “World Ice Art Championships”. Free pick up & drop off from your hotel.